Save Their Home? Bears or Babies? 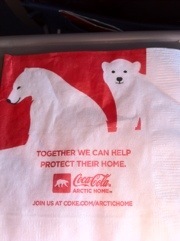 Flying Delta yesterday I noticed their new napkins. They place them on your tray so your glass doesn’t slide off onto the floor. Cute Polar Bears who supposedly have their ice dens threatened. The napkin makes an appeal for my money and political muscle to intervene – to help save their habitat and therefore their lives. But then I saw the second picture in the Michigan news today. 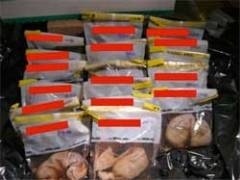 A photo showing the 17 unborn babies that were discovered in a dumpster outside Woman’s Choice Clinic in Michigan where I live. Sorry Delta. Sorry Polar Bears. There are clear cut priorities. Once we save the habitat of human babies and secure their lives and make their “homes” safe, then I can think bears hibernating in ice dens in the far North. Next post: Conjuring up the Dead on Catholic University Property?